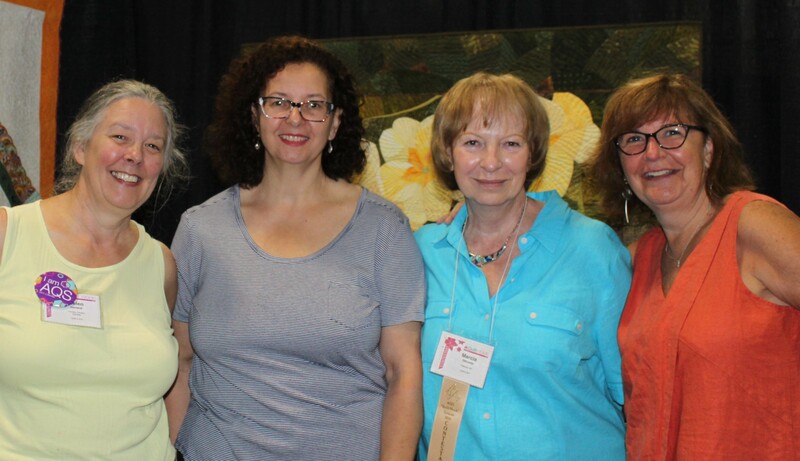 Join me at see an inspiring display of quilts made by the members of the Yorkshire Rose Quilters’ Guild of Toronto. 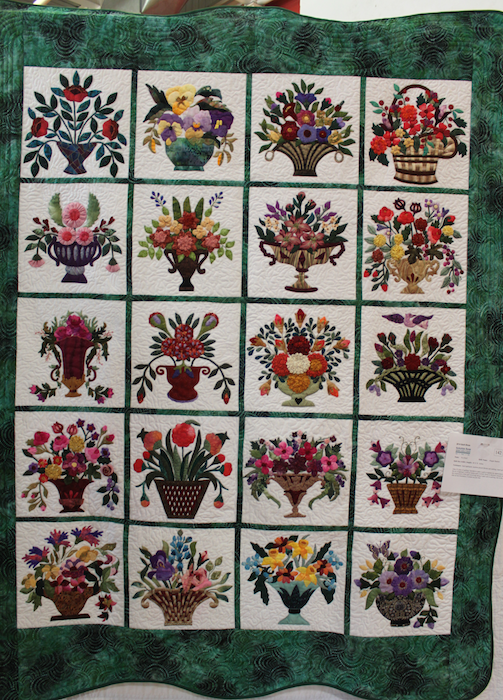 Over 100 quilts will be on display Saturday and Sunday September 22-23, 2018. A detail from one of my textile paintings is visible in the lower right corner of the postcard. To see the entire piece and the rest of the quilts I have in the show, come to the Ellesmere Community Centre, 20 Canadian Road, Scarborough. 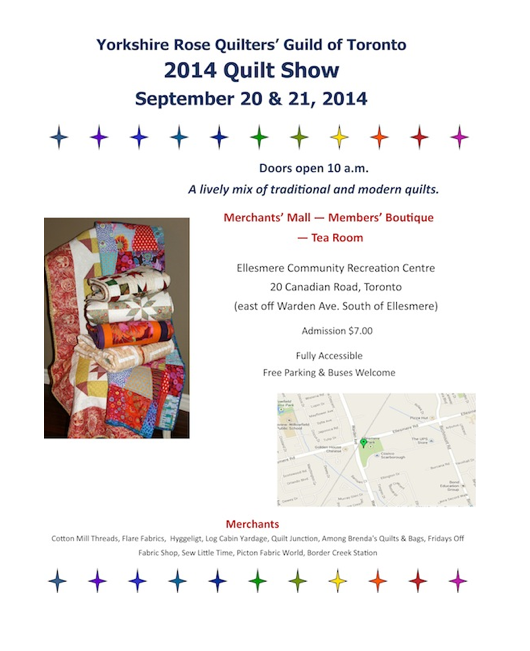 Hope you can join us and view the quilts, shop for fabric and rest and enjoy some sweets in the tearoom. 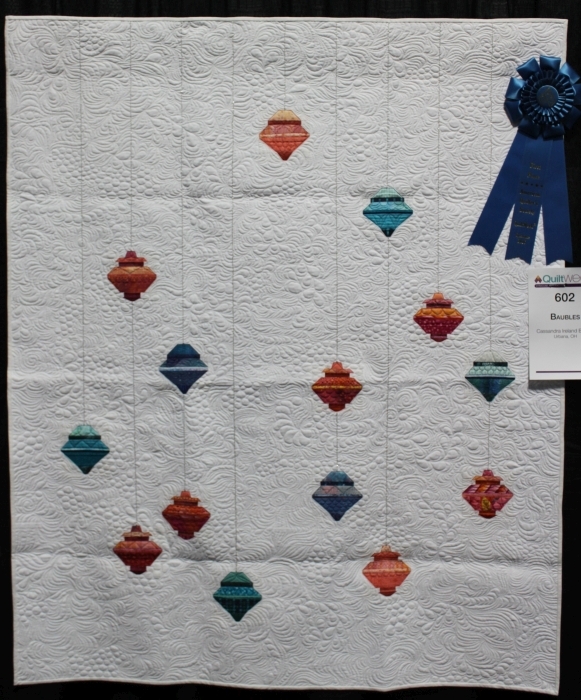 I didn’t photograph every quilt in the AQS quilt show in Syracuse but I was tempted! 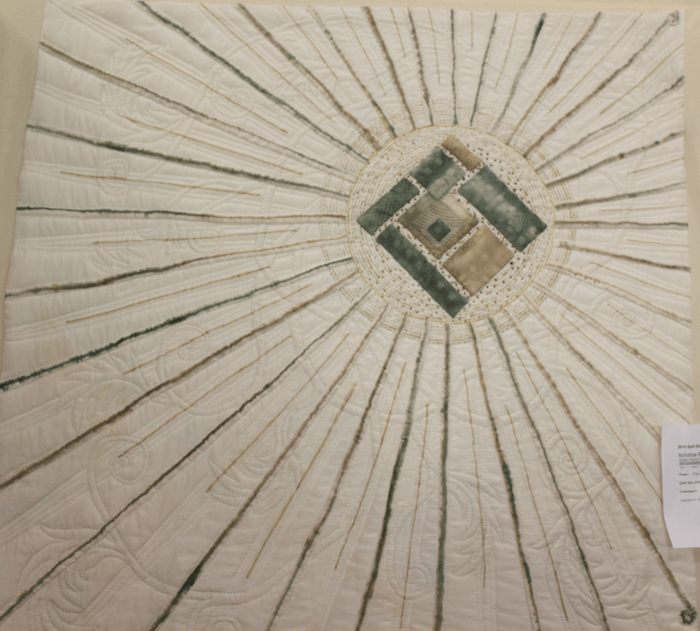 So many outstanding quilts were on display, it was overwhelming to take them all in. Of course, I did take some photos. 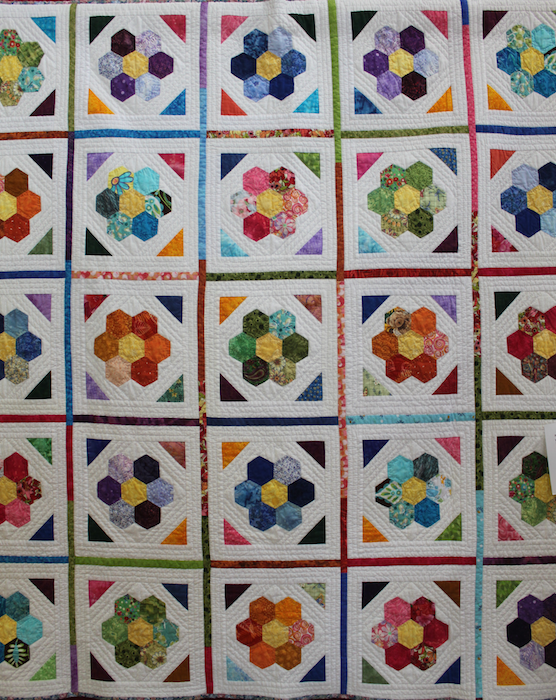 I love that Cassandra changed the colour of the thread as she quilted through each segment of the circle. There is a very subtle shadow of colour on the white fabric. 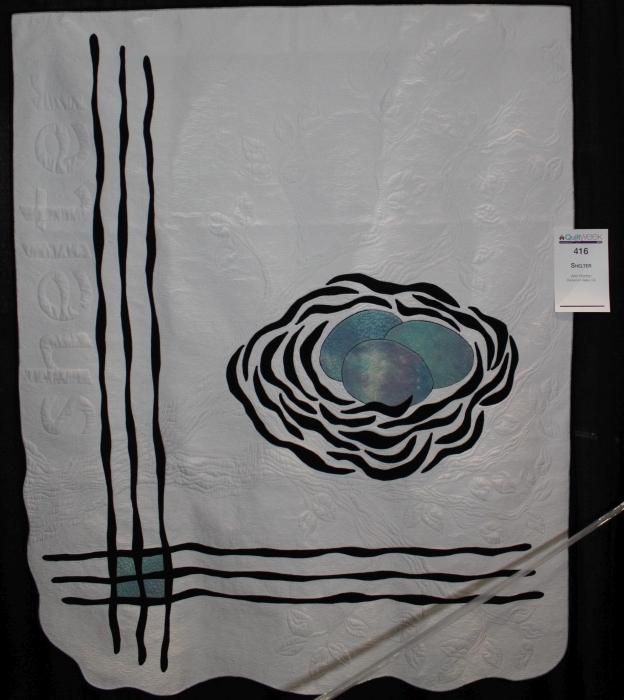 I love the beautiful soft colour of the eggs against the graphic black and white of the quilt. 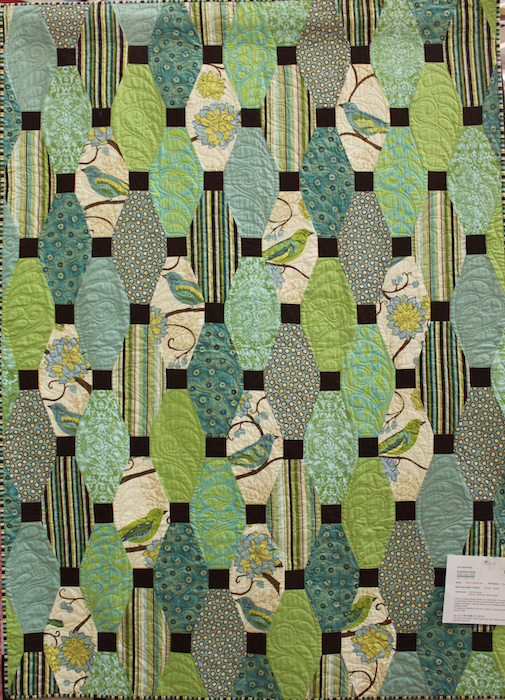 Ann’s quilt is beautifully quilted with leaves and branches supporting the nest. My photograph doesn’t do justice to this amazing vista created by Beth and long arm quilted by Clem. It looks like you could walk through the archway into a beautiful summer day. 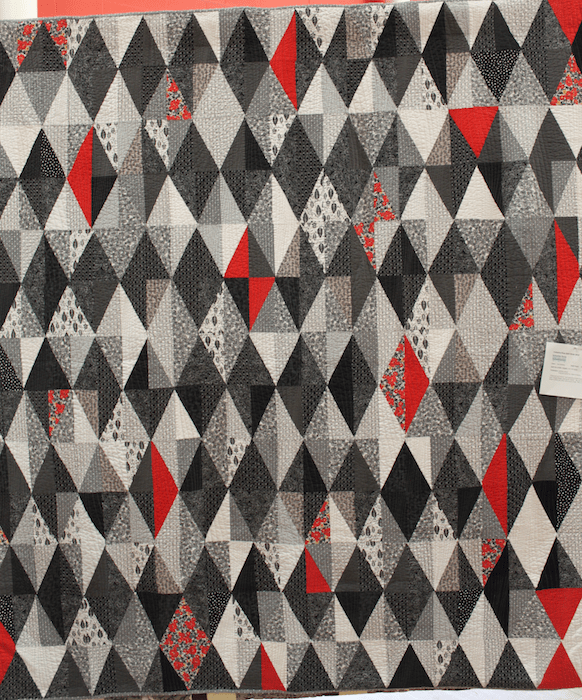 Claudia’s great sense of colour and design are apparent in this skillfully pieced quilt. 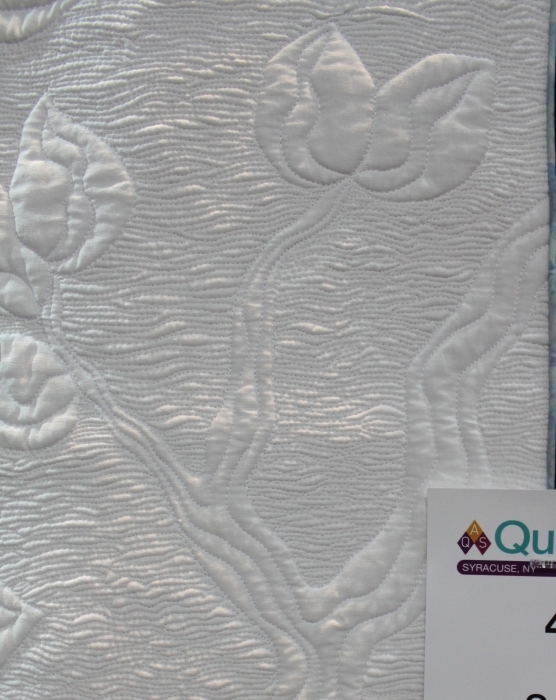 Marilyn’s long arm quilting adds beautiful depth to the design. I really liked Chris’ improvisationally pieced log cabin blocks in turquoise interspersed with purple and red. They really pop against the black background. The name of the quilt made me laugh! Connie, seems to have a good sense of humour and definitely a good sense of design. 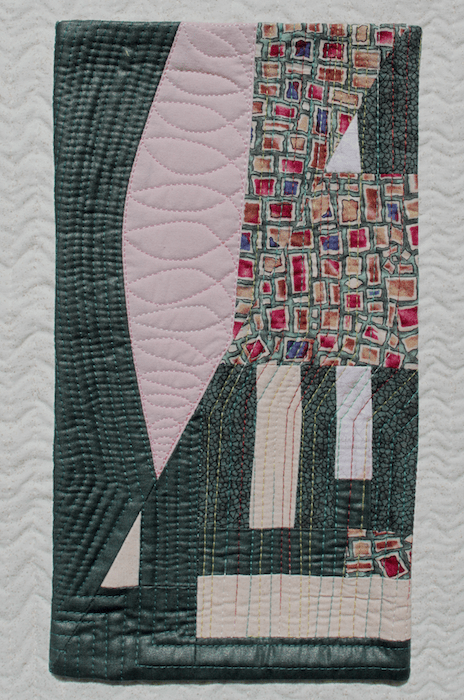 The machine quilting added visual interest and lots of texture. 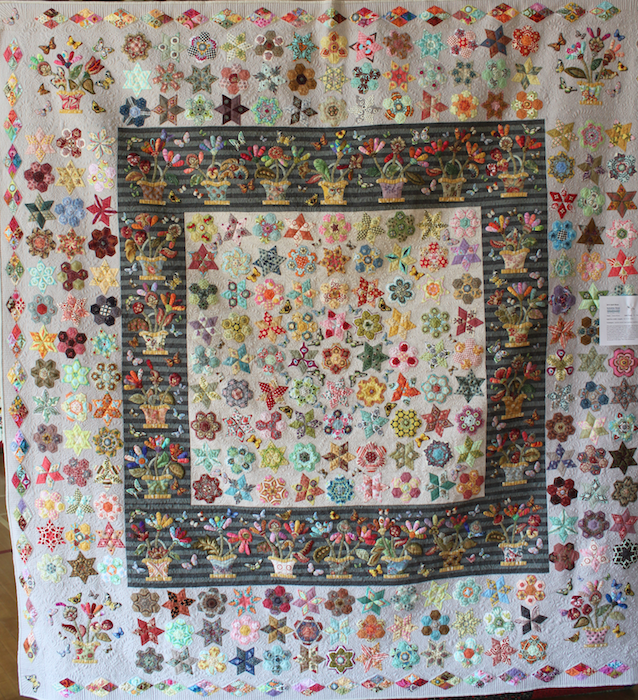 Melissa’s quilt was absolutley amazing to see in person. It appeared as if you could pluck one of the pillows off the shelf! 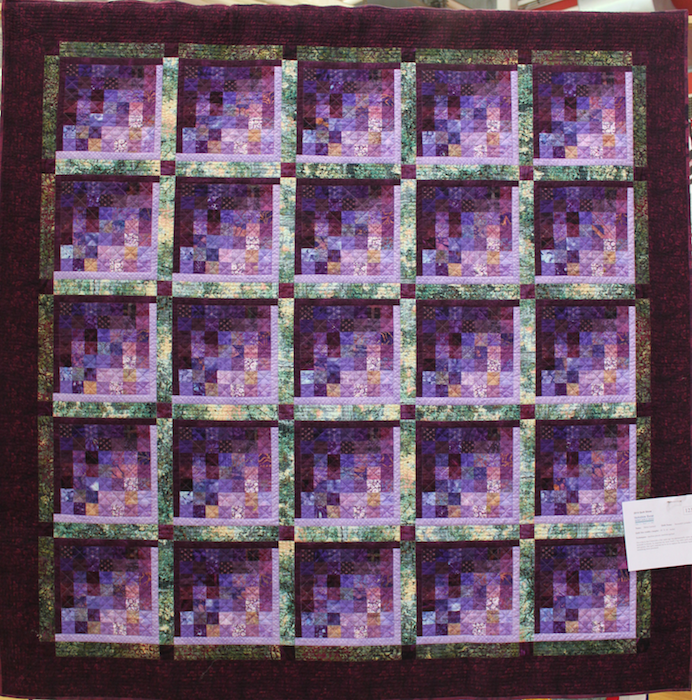 Charli’s quilting highlighted the strong design. 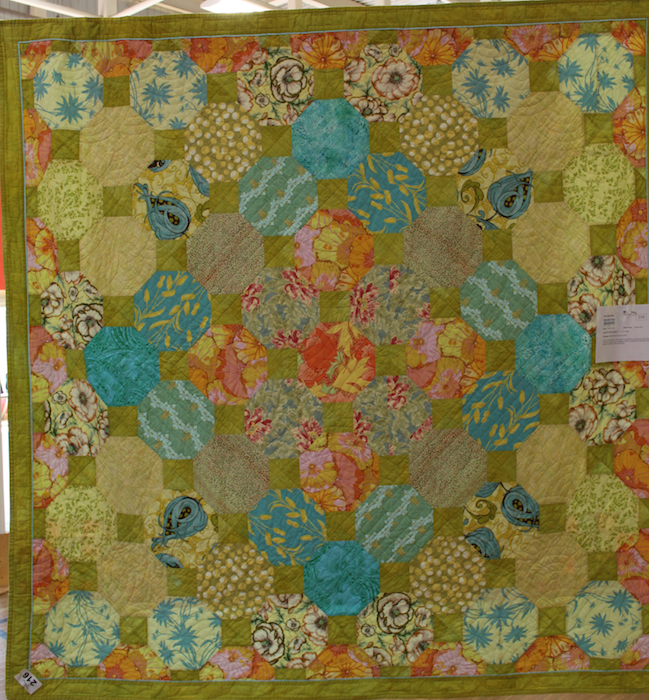 Cassandra’s quilt was whimsical, fun and amazingly machine quilted! 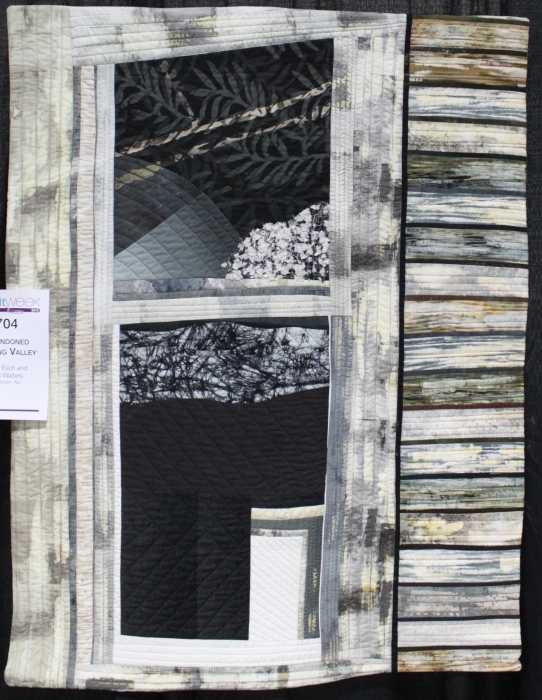 I really loved this quilt, the texture and colours really gave the impression of faded wood. Gorgeous work by Carol and Lois. This quilt made me smile. Sue has certainly written a great caption for her version: FIRST KISS #20 (1961) by Vince Colletta. 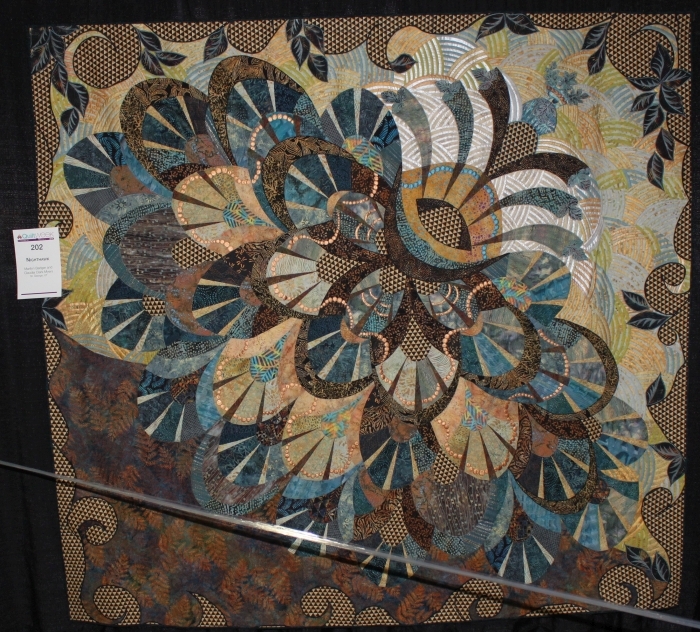 I encourage everyone to go out and visit quilt shows in person. Photographs don’t do justice to the amazing pieces of art on display. Go and visit a show soon! 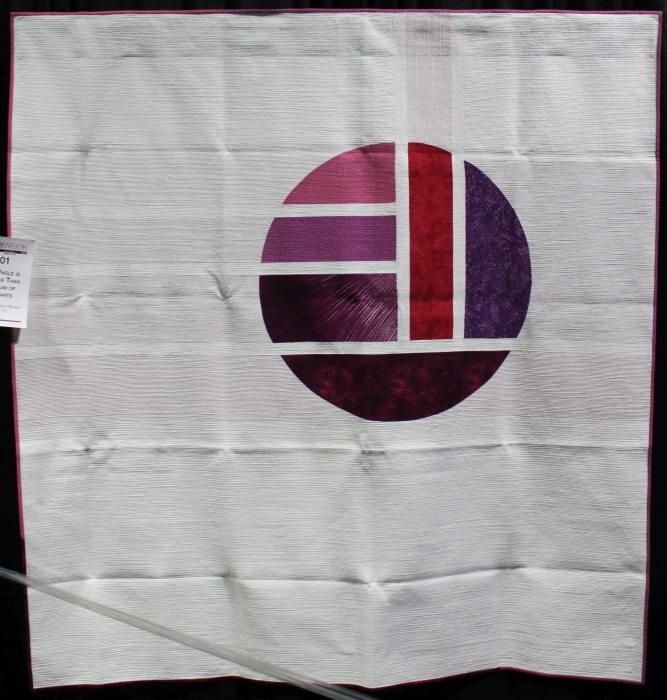 I attended the American Quilter’s Society quilt show in Syracuse this July. 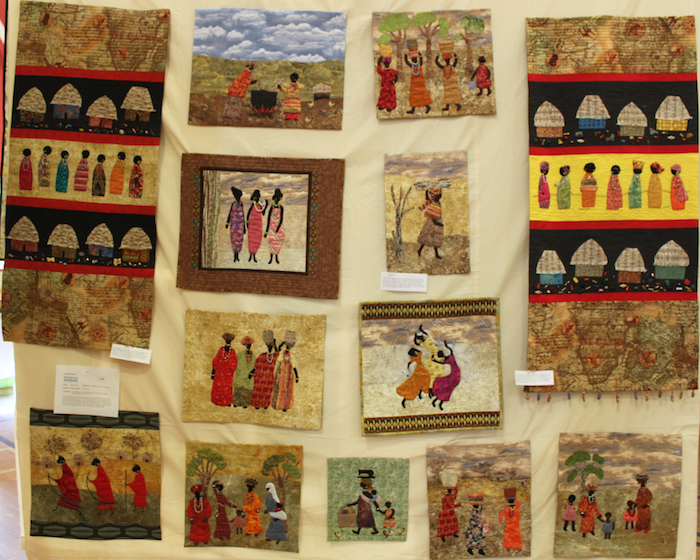 There were many beautiful quilts on display including two quilts made by my friends Helen and Marcia. 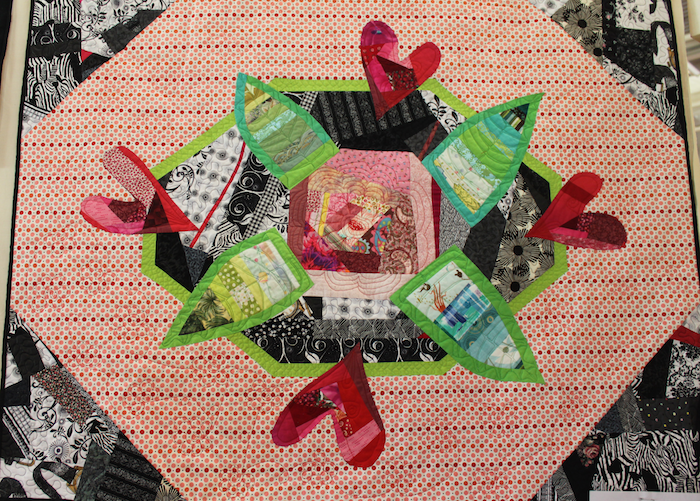 Helen is a quilter who loves piecing. 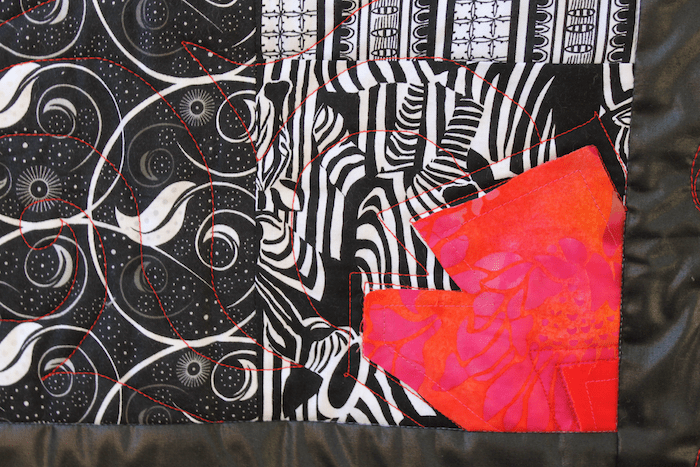 She has designed, pieced and quilted beautiful art quilts using photographs she has taken. 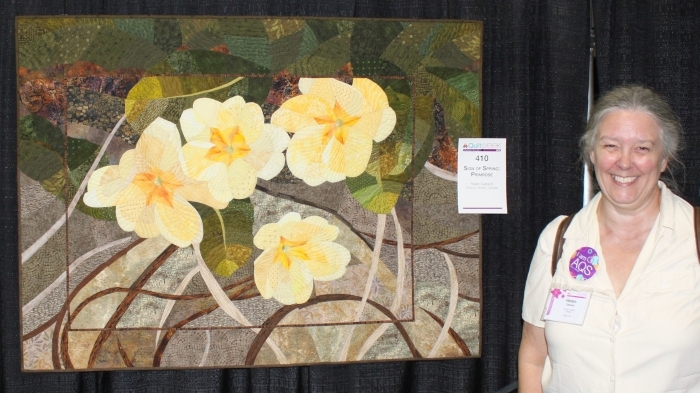 This quilt was designed from a photograph she took of yellow primroses. 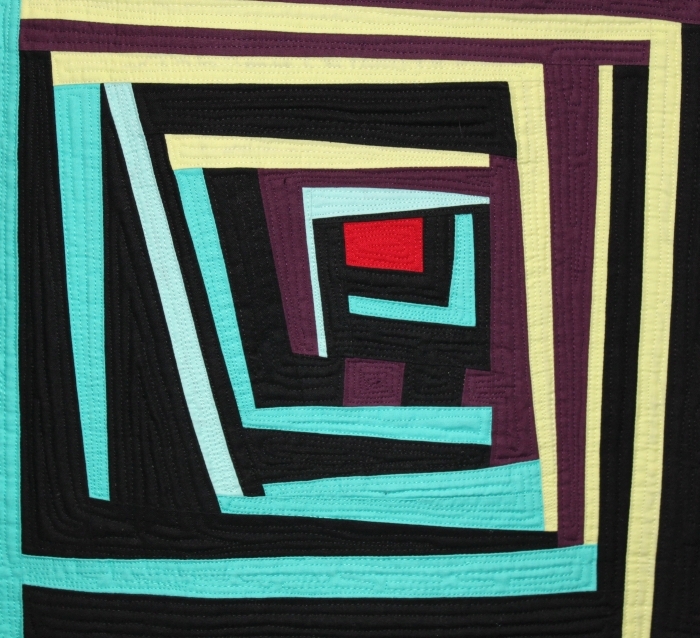 All of her quilts are machine pieced with no applique. 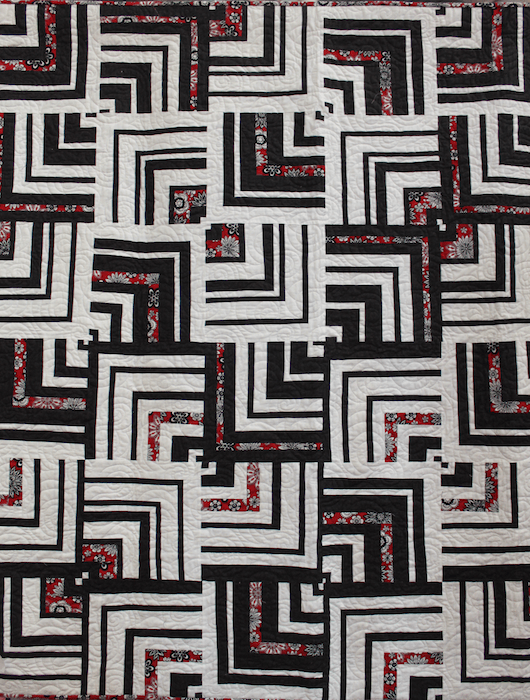 They are all truly stunning, with lots of details and beautifully machine quilted. Sign of Spring: Primroses is her first entry into an AQS show. 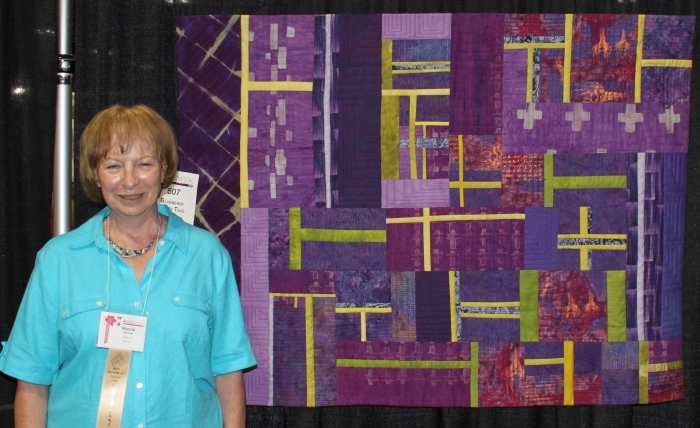 Marcia is a contemporary quilter who uses her hand dyed fabrics to create beautiful abstract quilts. Blueberry Green Teas is part of her Geometrics series. 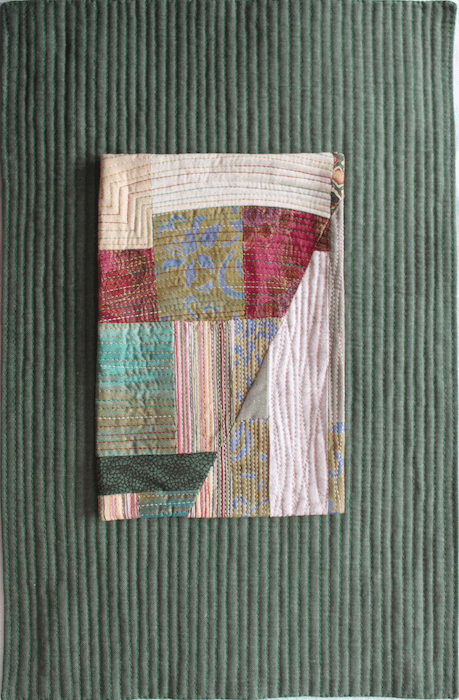 It is created using her hand dyed fabrics, some commercial fabrics and skillfully machine quilted. 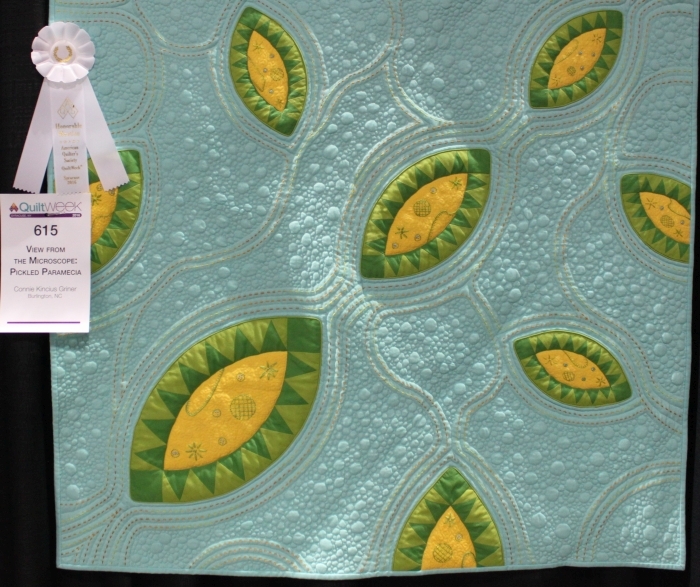 Blueberry Green Teas won an Honorable Mention in the Small Wall Quilts Longarm Machine Quilted category at the AQS Paducah show in Paducah, KY, in April of this year. 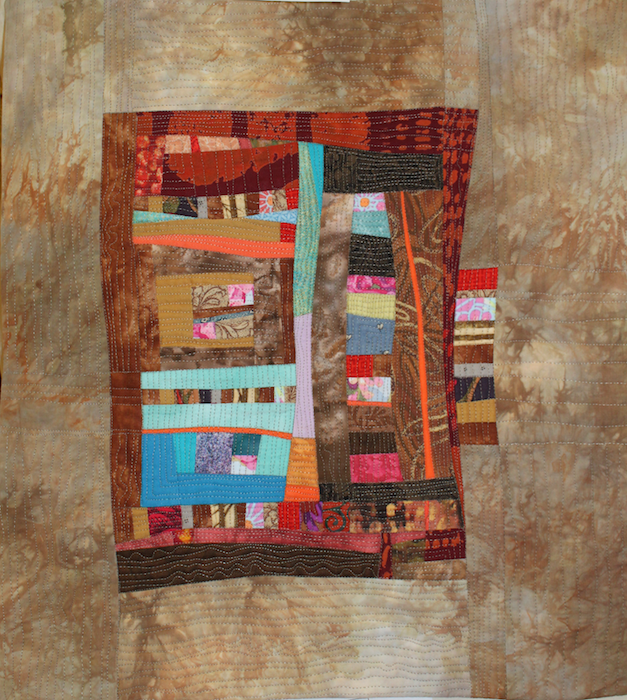 Jeanne Simpson is a contemporary fibre artist who designs abstract geometric quilts. She and Marcia attended the show and we were fortunate to be able to meet in person. It was wonderful to meet up, take some photos, talk about art, and quilting. Plans are being made for us to get together at another art show early this fall. How often do you meet with your friends and enjoy seeing some amazing art? 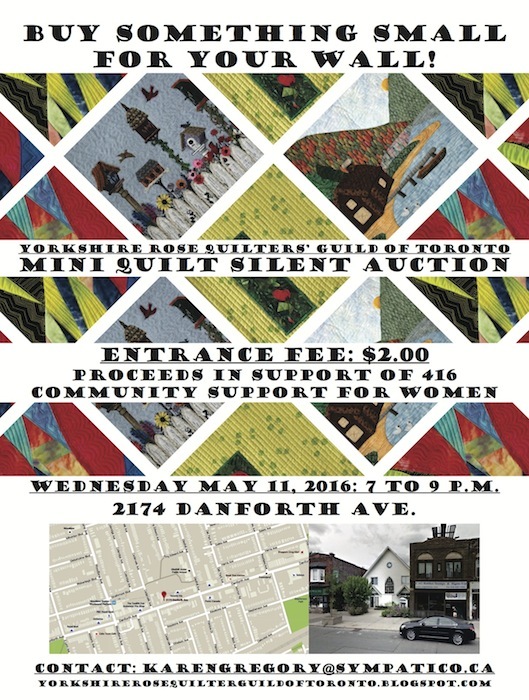 The Yorkshire Rose Quilters’ Guild of Toronto is hosting a Mini Quilt Silent Auction on Wednesday May 11, 2016 from 7-9 pm. at 2174 Danforth Ave. Toronto, Ontario. Please come out to see all the beautiful mini quilts, start your Christmas shopping early and bring home a beautiful piece of art. Enjoy coffee or tea, dessert and the company of a fun group of people. 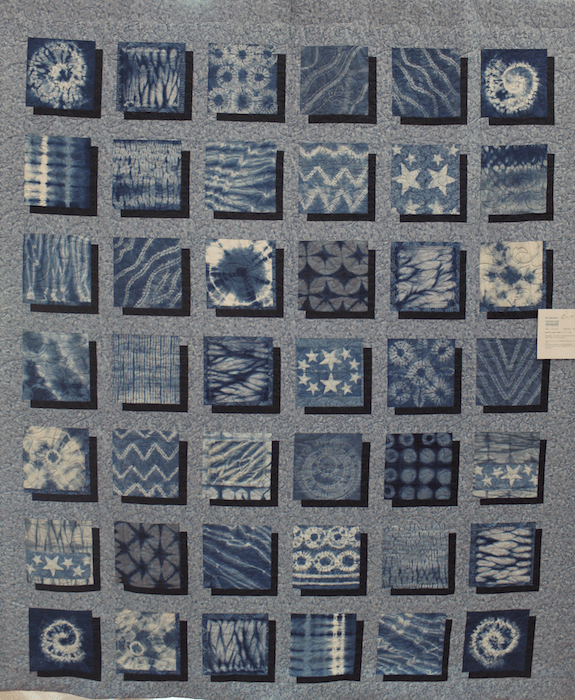 Of course there were many, many more quilts in the show. I hope you enjoyed viewing a small selection. 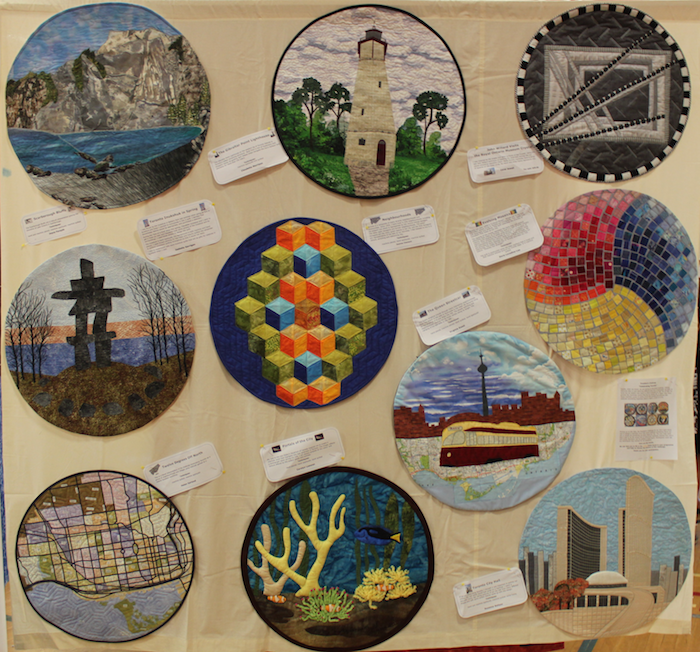 It was great to see so many talented quilters putting their works on display. 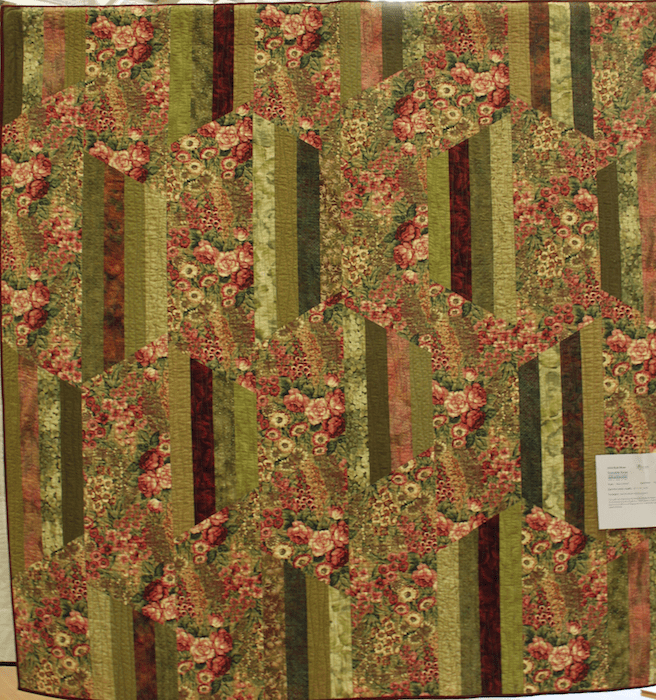 I’ll post more photos of quilts from the show soon. 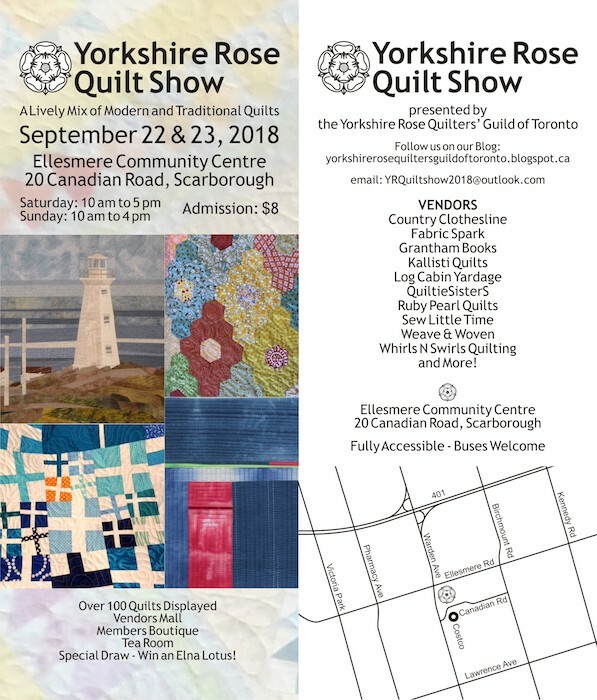 I hope you will join me on Saturday September 20th and Sunday September 21st for the Yorkshire Rose Quilters’ Guild of Toronto quilt show. 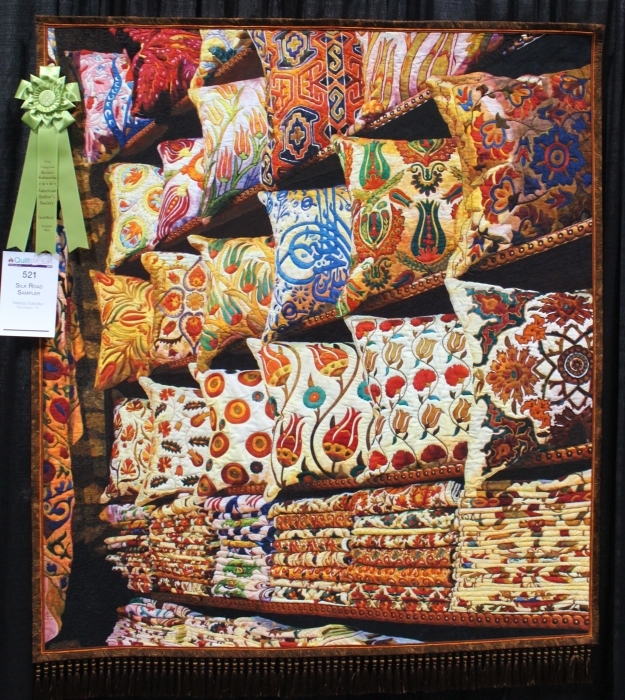 The quilt show will feature quilts from our very talented guild members. 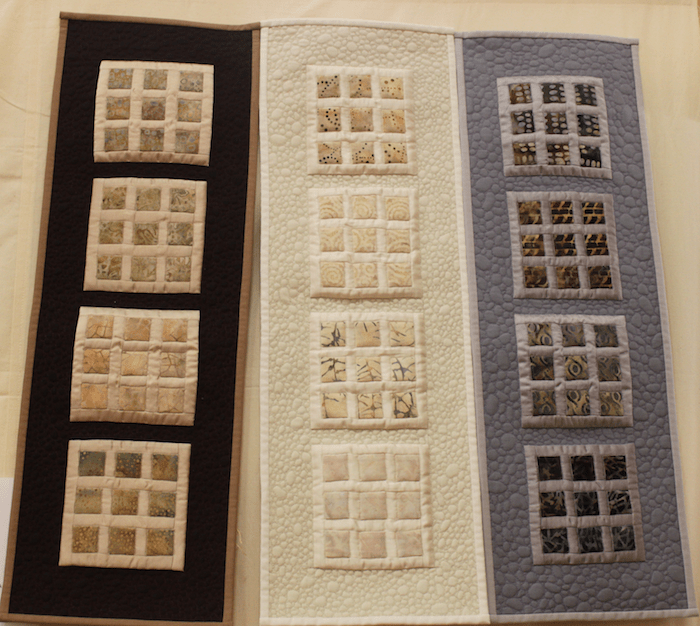 There will be both traditional and modern quilts featured. I have seven pieces in the show, including Icterine Strata I blogged about here. 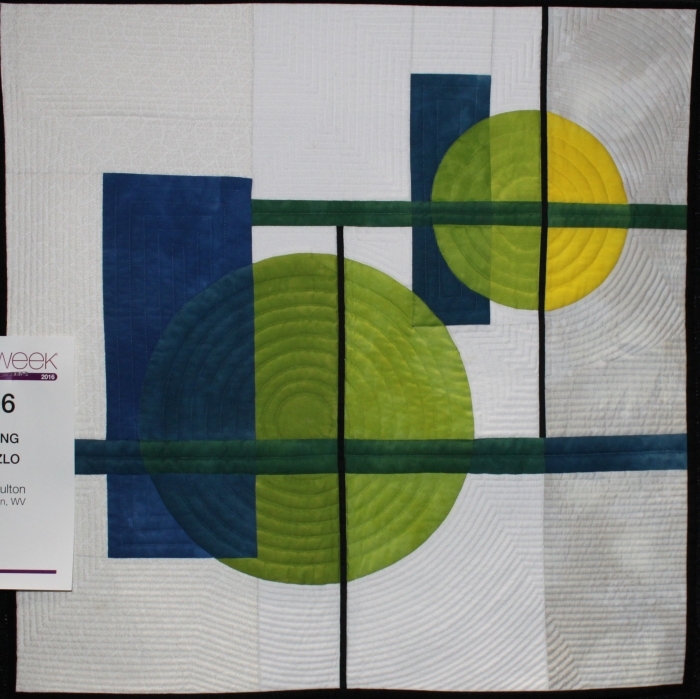 This piece won third place at the Canadian Quilters’ Association Juried show earlier this summer! Midnight Blooms is an original design. It is machine pieced and long arm quilted. 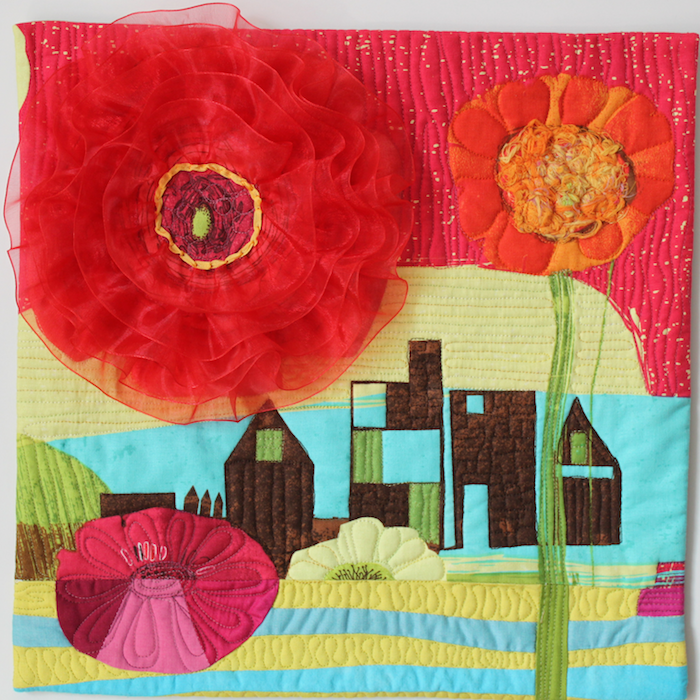 Large stylized flowers are raw edge appliquéd to the top. The design was inspired by a piece of Art Deco wallpaper. Plumage is based on marble tile design that my sister used in her renovated bathroom. 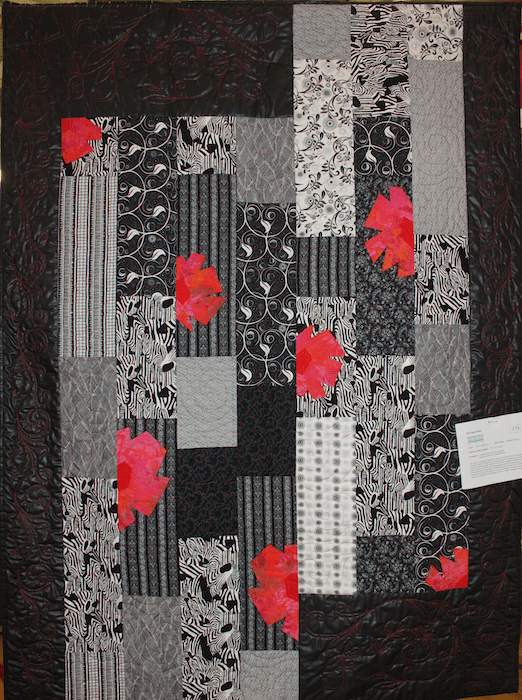 The quilt is machine pieced and long arm quilted. 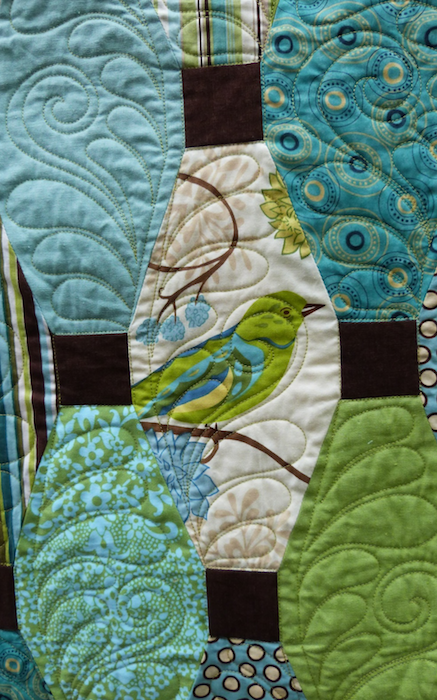 The focus fabric is fussy cut to showcase the beautiful birds. Floral Bouquet is a small wallhanging. Three dimensional flowers are arranged into a lovely bouquet hand tied with satin ribbon. It is machine quilted. 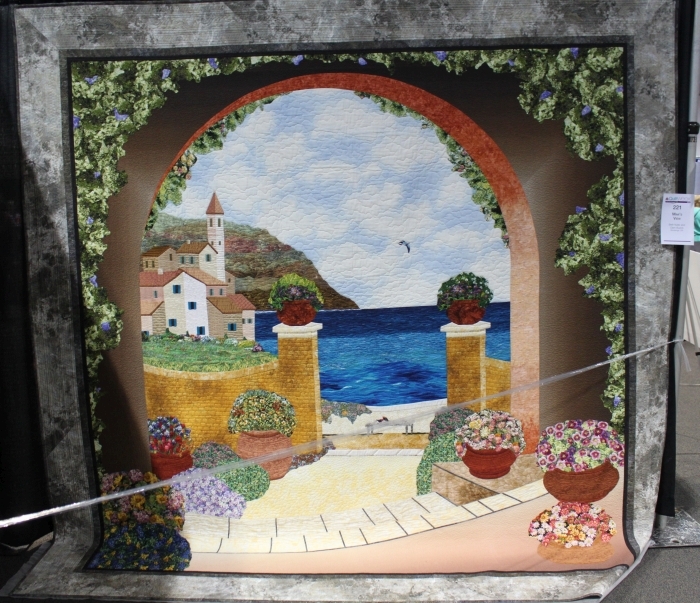 Village at Dusk is a triptych arranged onto a quilted mat. 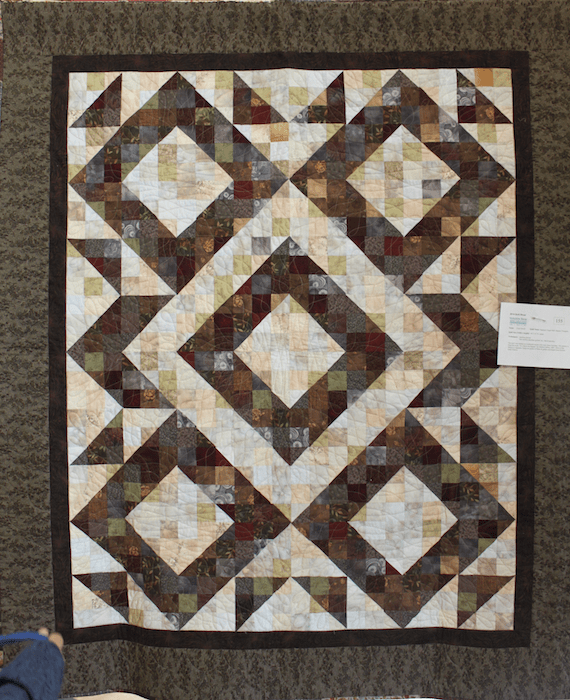 It is improvisationally pieced and machine quilted. 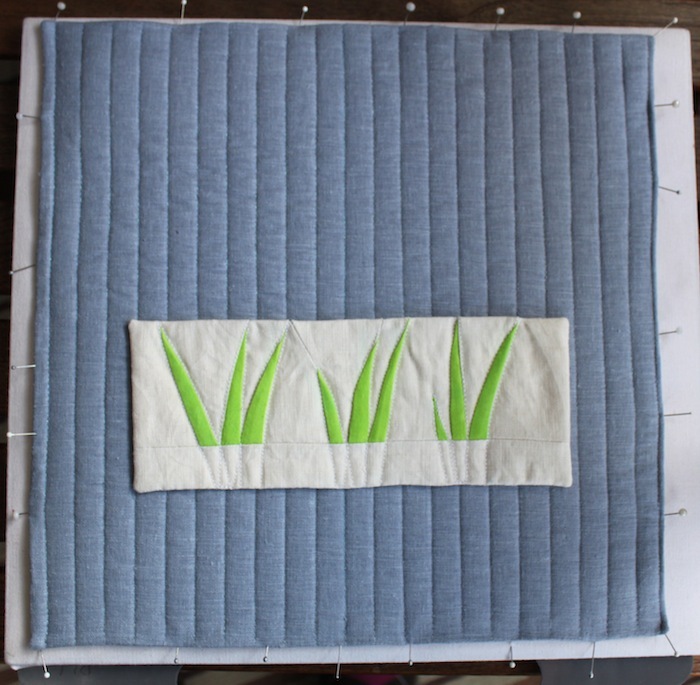 Morning Meadow wallhanging is improvisationally pieced and machine quilted. The piece is beautifully framed with a quilted matting. These photographs are detail shots of some of the pieces I have in the quilt show. In order to see the quilts in their entirety, you will need to come out and visit the show Saturday Sept. 20th to Sunday Sept. 21st. 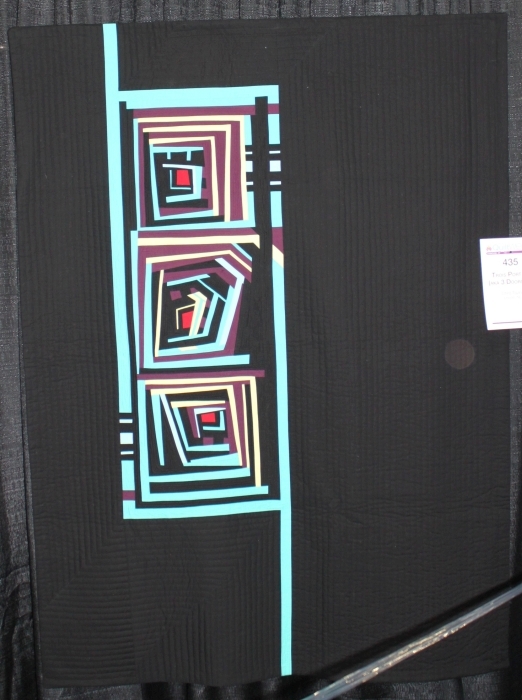 Some of the quilts on display are being offered for sale, (including a few of mine). 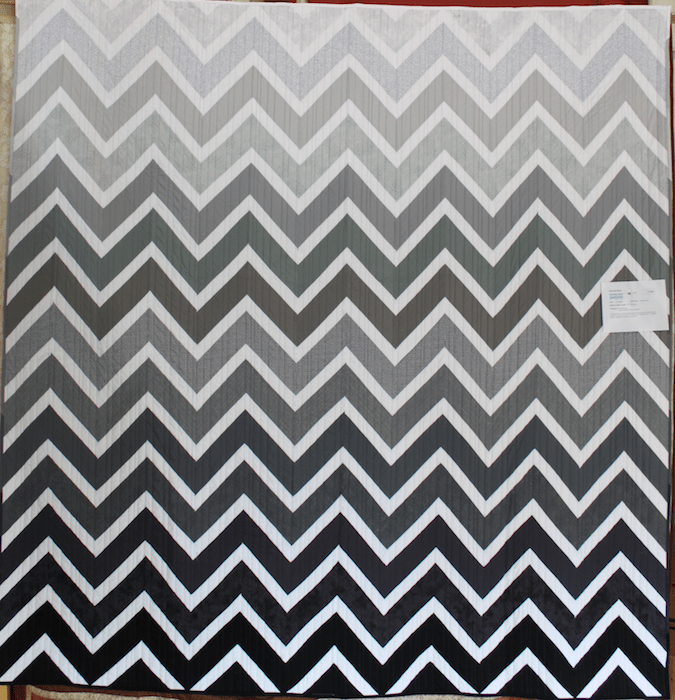 This is a great opportunity to purchase a one of kind quilt for yourself or as a Christmas gift. Bring a friend, enjoy the quilts, have a lovely tea, browse the merchant’s mall, and be inspired! 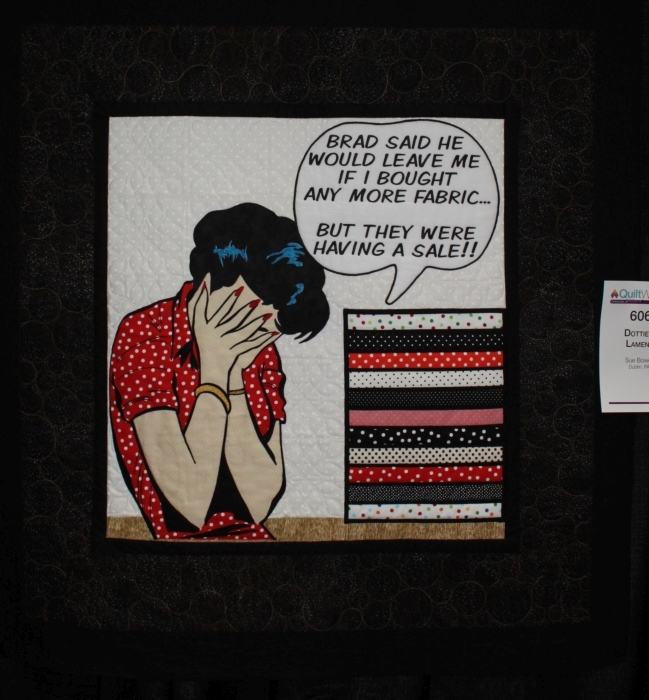 How do you feel after you’ve attended a quilt show? Tired! but also invigorated, excited and full of creative energy too! I just attended the spring Creativ Festival and left with ideas swirling in my head as well as many purchases. Seeing the new gadgets, colours, and designs is inspiring. The creative energy, and seeing so many beautiful finished projects spurs me to actually finish up some of the many, many projects I’ve begun. Are you the type of person that goes home from a venue such as this and immediately begins a new project from your purchase? Do you patiently put your purchases aside until you’ve finished the one you are working on? I’ll admit that I do a bit of both! It’s difficult to resist the lure of bright shiny new purchases. Ideas and possibilities spin through my head and I can envision the finished project. Sometimes, though, attending these shows gives me just the nudge I need to finish up a project or two that I’ve been procrastinating over. One of the vendors at the show – Steam Trunk Craftworks from Surrey, BC, had a gorgeous selection of trinkets that gave me just what I need for an idea I’ve been mulling over. 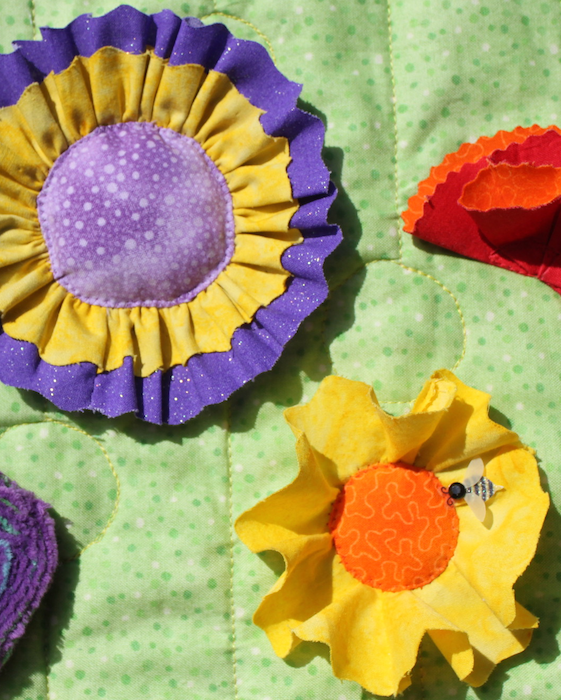 They sell a wondrous selection of notions from buttons, beads, charms to trims and ribbons. Their beautiful, vibrant sari silks drew my eye. They are lengths of silk repurposed from saris and are used to embellish, knit or crochet with. The colours were a feast for the eyes. They also had hand dyed bags of yarns that I couldn’t leave behind. These items were from Nell’s Embroidery. I purchased a couple of packages of yarns that included 5 metres of each of these beautifully hand dyed fibres: rayon chenille, mercerized cotton, rayon ribbon, cotton boucle, perle cotton with coordinated beads and sequins. Check out her shop on Etsy. She has a gorgeous selection of yarns. I can’t just put these gorgeous fibres away! I will certainly be working on them immediately. Check back to see what I create.